Mara is a successful lawyer, and devoted wife and mother. Struggling with a devastating illness, she has set herself five days to make the ultimate decision for her family. Scott lives a thousand miles away, and is a foster parent to a troubled eight-year-old. 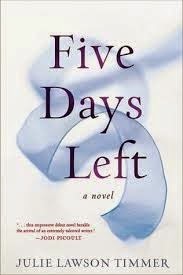 Scott is facing his own five day countdown until his beloved foster son is returned to his biological mother. The two connect through an online forum, and find a friendship to help guide them through the most difficult, and momentous, week of their lives. I have had Five Days Left sitting on my TBR pile for a couple of months as I went through a faze of reading a lot of emotional reads all at once and needed something a bit more uplifting but I saw this one sitting in the pile today and decided it was time. The chapters alternate between our two main characters points of view who both have Five Days Left, Mara who was once a successful lawyer who worked long hours and then came home to be a doting wife and mum to Lakshmi. But her life has taken a dramatic change after discovering she is suffering from Huntington's disease and she is losing her ability to control her body and her thoughts which she can not bare so she decides to give herself Five More Days. Scott has Had Curtis living with him and his wife for a year and he has become so close to this little boy but he only has Five Days Left until he leaves them. This was such an emotional, poignant read that literally broke my heart.this was such a realistic and deep storyline that really touched me. I warmed to both Mara and Scott and their storylines and unusually for me when there are split main characters and stories, I didn't prefer one to the other. I surprised myself with my thought process in this book because when I was first introduced to Mara and discovered what she was planning to do there was a part of me that thought she was a bit selfish and how could she plan to do what she was planning when she has a beautiful little daughter and loving husband but as the book moved on and the author shows us what Mara deals with day to day and how it not only effects herself but loved ones around her I began to understand why Mara had come to her decision. Julie Lawson Timmer has a beautiful, flawless writing style, she manages to keep the reader engrossed from start to finish and she creates such heartfelt emotion in a realistic storyline. I was absolutely captivated by this storyline, this is definitely a heartbreaking and though provoking read.